Our friend Joon is celebrating his birthday tonight with a get together my husband is hosting. I wasn't sure of Joon's favorite cake flavor so I took the liberty of finding a recipe I thought the guys would like. I didn't want to make anything to heavy or rich so a light and airy angel food cake fit the bill. Topped with a strawberry coulis and fresh berries, how could they pass it up?! It's a small gathering of buddies and instead of making a big cake, I made mini cakes that the guys could enjoy. I baked the batter in a jumbo muffin pan that makes 6. If you don't have a jumbo muffin pan, you could also bake in a regular standard size muffin pan that makes 12. You'll have to adjust the recipe by reducing the bake time if you decide to bake in a standard muffin pan. What I love about this recipe is that it's a perfect little treat to have your own individual cake when baked in a jumbo muffin pan. Aside from it being light and airy, it's an easy recipe to prepare too. The strawberry coulis just adds the perfect amount of fruity sweetness and makes for a beautiful presentation too. So enjoy this cake recipe because it's practically guilt free! Preheat oven to 350 degrees F. Have your ungreased jumbo muffin pan ready for filling. Carefully spoon mixture into an ungreased jumbo muffin pan to fill about 2/3 full. You may have some extra batter and if you do, you could bake it in a regular ungreased muffin pan. Bake in the preheated oven for 20-25 minutes before checking for doneness with a wooden skewer. (When inserted halfway between the inner and outer wall, the skewer should come out dry). Cool upside down on cooling rack for at least an hour. Once cooled, cut off the tops of the mini cakes with a serrated knife while still in the muffin pan. Carefully remove the mini cakes from the pan by running a flat knife along the edges. 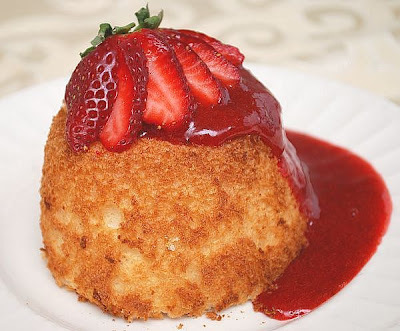 To serve, place cut side down on a plate and spoon over the strawberry coulis. Garnish with a sliced strawberry.